In 2015 Imprint Tours had its first tour of Vietnam. As there is currently an Imprint group in this up and coming Southeast Asian nation, and another scheduled again next February, it seems an appropriate time to share some of the recollections from that first foray. I had no serious trepidation about how I, as an American, might be treated. But I would be lying if I said I expected such warm and welcoming treatment. The war is a distant memory here and American visitors represent commerce, income, and prosperity. Relaxed attitudes, genuine smiles, and open hearts were the order of every day on the tour. And that constant will probably be reflected in all my blogs. Overall, I found our Vietnam tour to be one driven by cultural connections far more than big bang sights. Hanoi, where we began, reflected that dynamic as well. It was the perfect place to start. The city is big, busy, and loud but it has a welcoming energy and ambiance and I felt relaxed right away. The Temple of Literature and Hoa Lo Prison (aka the Hanoi Hilton) were interesting and engaging. But they were hardly jaw-dropping. I enjoyed them both, but not more so than wandering the streets, trying street food, and engaging the locals who spoke English. Oh, and while hardly a pleasant highlight, the number one sport for pedestrians is dodging the almost astronomical number of motorbikes in the city. They swarm like locusts, only pausing for the occasional red lights, behind which they gather like water behind a newly constructed dam. Building up pressure, widening out behind, filling every void, the kinetic energy building for the big surge when the light turns green. The Temple of Literature is well worth visiting of course. 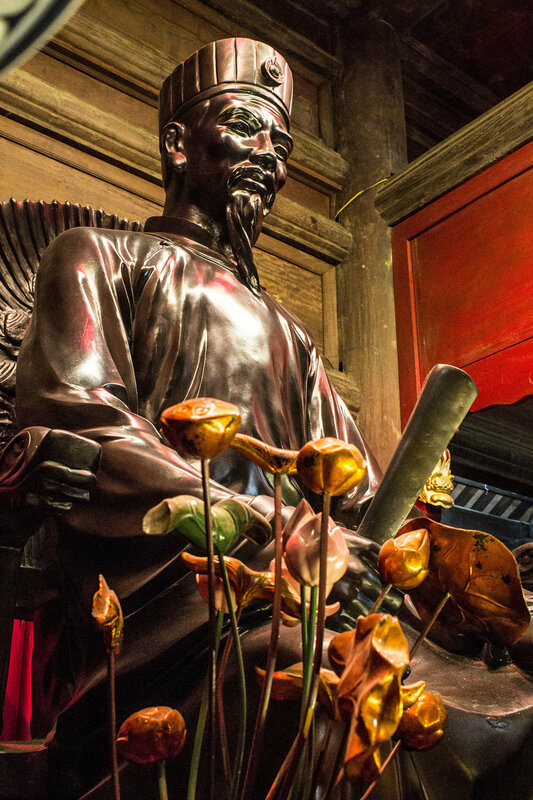 Almost 1000 years old, it is dedicated to Confucius and honors Vietnam’s literary heroes. The entrance gate is one of the iconic images of the city and country, a classic example of Vietnamese architecture: multi-tiered with Chinese-like winged flourishes. Manicured gardens surround you as you pass a gallery featuring 82 stelae, which proclaim the genius of 1300+ scholars and writers from Vietnamese history. 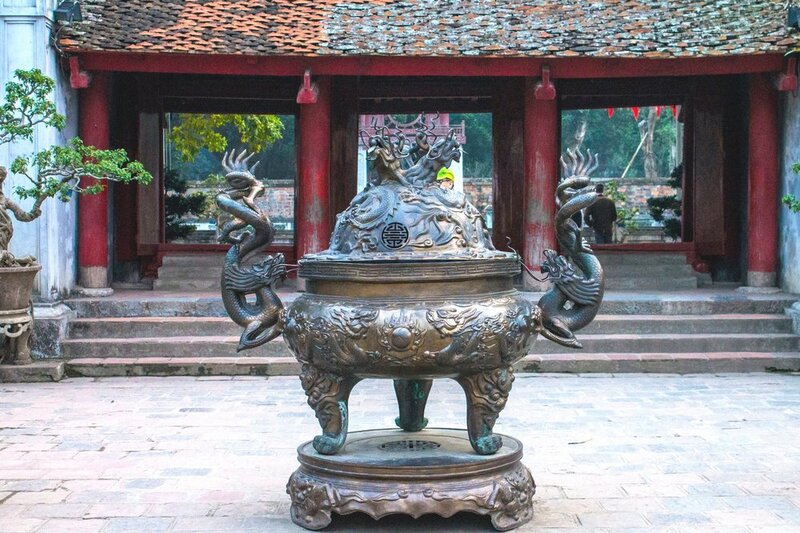 Each stelae rests on the back of a turtle, a sacred animal in Vietnam and symbol of wisdom. The culmination of the compound is a grand courtyard entered via the notable Khue Van Cac (Pavilion of the Constellation of Literature), built in 1802. The most imposing building on the courtyard is a temple dedicated to Confucius. It’s interior is dominated by an impressively large statue of the great teacher. Incense burns in great sand-filled cauldrons, lending an air of mystery and mysticism. Hoa Lo Prison, better known as the Hanoi Hilton (the name coined by American POWs), is a different kind of experience all together. As one would expect, it is hardly as uplifting as the celebratory Temple of Lit. The timbre here is more sobering. Most of the exhibits feature scenes from the colonial period when the French built and used the prison for the incarceration of rebellious Vietnamese. But a few rooms feature images and artifacts from the Vietnam War, when US pilots were imprisoned. Visitors see a very sanitized version of life in the prison, which of course is at odds with the documented reports of those who were housed here. But that is to be expected. Two last sights are certainly worth a photographic drive by. Ho Chi Minh’s Mausoleum is an expectedly large and imposing building. Reminiscent of the political architecture of the Chinese Communist Party to the north, it is certainly a fitting memorial to their independence hero. The second is lovely Hoan Keim Lake. A stroll around this lake provides a peaceful respite from the hub-bub of the urban surroundings (though one does not escape the sound of the relentless traffic). It is particularly peaceful at dawn before the city fully wakes up. A picturesque temple on a tiny island make the lake one of the most photographed subjects in the entire country. One last “event” bears mentioning. Vietnamese Water Puppets are a bit of performance art worth seeking out. Unique to Vietnam, it was invented by rice farmers about a millennium ago. They carved puppets out of fig tree wood (water resistant) and performed in ponds or flooded rice paddy fields. Today, eleven trained puppeteers manipulate elaborate puppets up to two feet long and weighing 30+ pounds in a square tank of waste deep water. The clever manipulations make the figures appear to walk on water. It takes considerable skill, long years of training, and the techniques are a closely guarded secret. The performance is truly unique, visually engaging, and simply a lot of fun. I think it’s a no-miss activity in Hanoi. Hanoi, with its international airport, is certainly the ideal place to start a north to south trek through Vietnam. I would say it is worth one single day of sight seeing, and another couple of days as a base for seeing the many interesting things nearby. On our tour, we ventured to Tam Coc and Halong Bay, but there are plenty of other worthwhile things to see in the north.